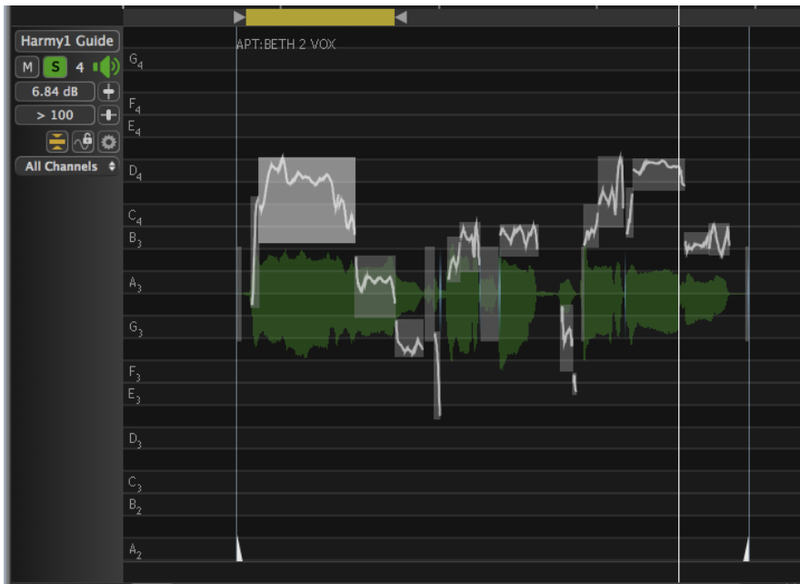 For "stacked" vocals or instrumental parts, it is simple to use one track (optionally prepared with tuning and timing adjustments) as the Guide input to multiple APT and/or Doubler processes. The same procedures can be applied to monophonic instrument tracks. In this section - we approach this by creating the APT and Doubler processes one at a time, rather than using the Create Multiple Processes function. Select the Preset Tight Timing only and press N to create the new APT process and output. There are two ways to correct the pitch of the Harmony track. Firstly, and most simply, you can use the Warp Region process to make pitch modifications directly to "Harmy Vox1" and then use that track as the Dub in an APT and apply the preset Tight Timing only using Lead Vox1 as timing guide. This would create the pitch and time- corrected output into Harmy1 Guide, ready to be used as a Harmony Guide for doubles of the same harmony. 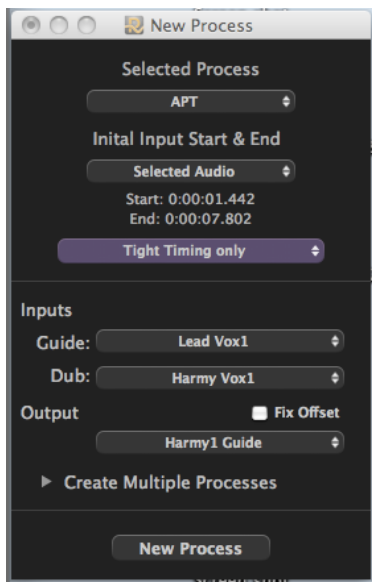 Alternatively, instead of modifying the Dub, you can expand the Output track ("Harmy1 Guide") to full height as shown below to make any manual pitch modifications required using the techniques here (except automatic pitch correction). 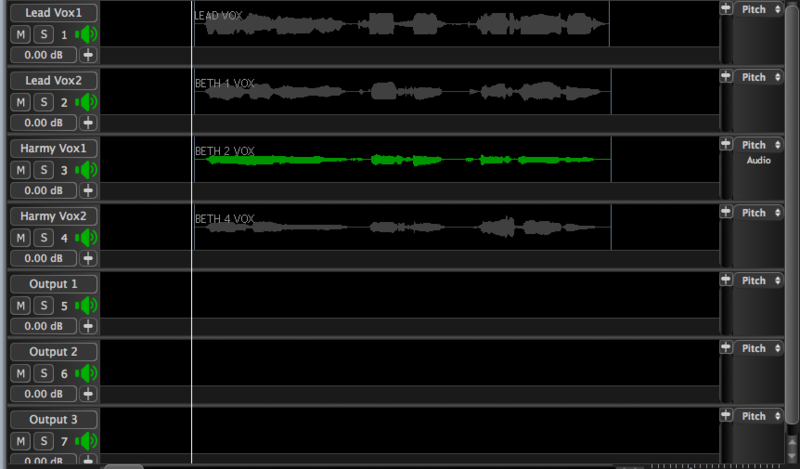 We recommend using the A and E keys to switch the Lead vocal on and off while you adjust the Output. 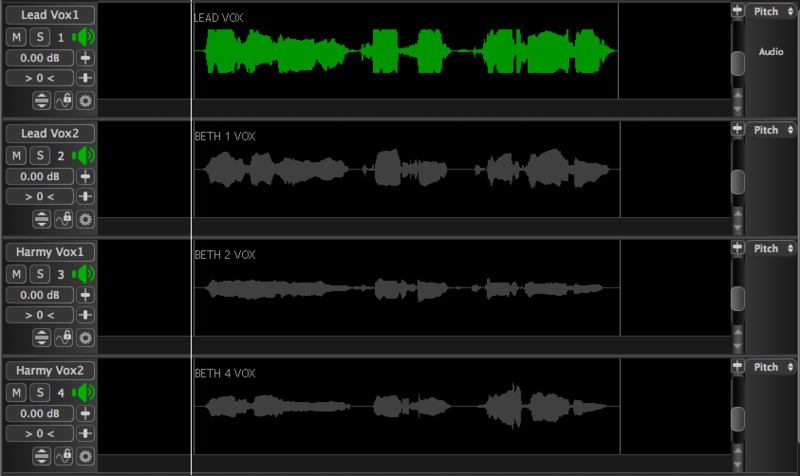 Return to the Multi-Track view and, if necessary show all tracks by pressing the X key. 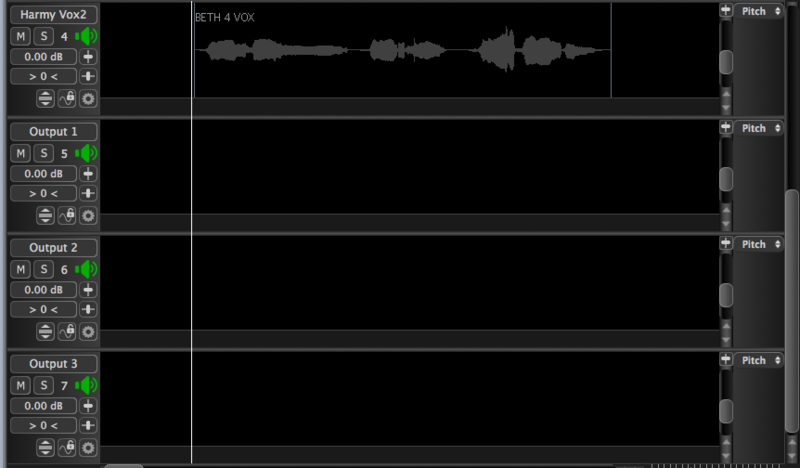 The New Process window also shows we have changed the Preset for this double to "Vocal - Slightly loose Time and Pitch".